Ireland has a maze of blissfully quiet country lanes, each of which has a story to tell. There are tiny fishing villages, early Christian ruins, Ireland’s highest mountains (don’t worry you cycle around them!) 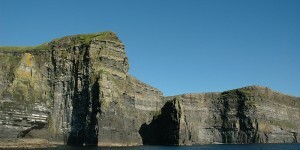 and islands along the wild Atlantic coastline. For cyclists who long to get away from it all, it doesn’t get much better than the southwest of Ireland. Out at the very edge of Europe, the southwest region is a land of extremes, from rich green rolling fields, isolated villages and mountains to wild seascapes and craggy coastlines. Cycle along parts of the Wild Atlantic Way, the infamous Ring of Kerry and with one pedal in Kerry & the other in Cork the Ring of Beara. These cycling routes are heaven for anyone who loves to travel on two wheels. Our independent self-guided cycles allow you to slow down and enjoy Ireland’s incredible scenery, landscape, spirited communities and culture. These cycling tours are suitable for all ages and abilities – you do not have to be super fit. The average daily distance is an easy 25-30 miles (40-48 km) at your leisure, with longer routes available each day. 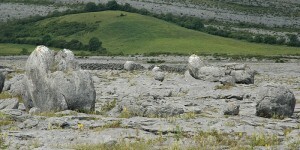 Go Visit Ireland will look after your accommodation. We have chosen beautiful guesthouses with character in a variety of locations to give a true flavour of Ireland, luggage transfers, cycling notes and maps and we are always on hand for any questions or emergencies for the duration of your holiday. If you don’t have 7 nights, no problem! We can amend the itinerary by adding or removing days to suit you. Contact us now and we can organise the tour just for you. Pedal the Peninsula, the Dingle Peninsula. 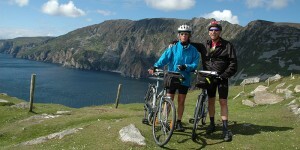 Cycle the most spectacular landmass jutting out into the Atlantic Ocean on the most westerly point of Europe. Pedal your way around the famous Ring of Kerry and enjoy one of the most picturesque routes not only in Kerry but in Ireland. 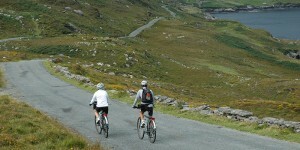 Cycle Kerry & Cork is this multi county cycling holiday. This unique trip has the contrast of having the first and last night in the lovely town of Killarney and for the rest of the week you enjoy the Beara Peninsula with its great rugged rock and seascapes – the most extensively panoramic route by the sea in Ireland. Nestling between the sea and mountains, Dublin has an unrivalled setting, yet few visitors move beyond the city centre to experience this! Walk & cycle the beautiful Kingdom of Kerry in this wonderful self-guided leisurely walking and cycling break, perfect for individuals, friends, groups and families. Note: We recommend that clients bring their own helmets and raingear for comfort and hygiene purposes. We do have a limited number of Electric bikes and road bikes available for our cyclists who wish to ride with ease and in comfort. Please just contact us directly for further information. We do provide small pannier bags in which you can keep your day to day items. From €670 per person sharing. €250 per person. Please note for single travellers: If there is only 1 person on the route at any time there will be an extra luggage transfer charge. Please state at the time of booking whether you want the notes in English, French or German. 21 speed touring bike (this year’s model), carrier, mud guards and pannier bag.